Avon Grove pitcher Maggie Balint leaps into the arms of her catcher Alyssa Herion, moments after a game where Balint threw a four-hitter to earn the victory in a 4-2 win over North Penn, to earn the Red Devils the District 1 softball championship title on May 29. There is a trophy case at Avon Grove High School that contains the mementos of nearly every successful athletic team in the school’s history, dating back to even before the current school was erected. 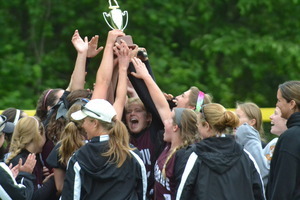 Years from now, perhaps with a spouse or a child in tow, the members of Avon Grove’s 2014 softball team will find their way back to their alma mater, go to the trophy case, and look for it, the trophy they earned on the cold afternoon of May 29 that signified that they were the first team in school history – in the history of Chester County, in fact – to become District 1 Class AAA champions. They will remember that the trophy was first raised at a little after five p.m. in left field on the softball field at Great Valley High School, mere moments after their sophomore ace pitcher Maggie Balint got North Penn High School’s Alyssa Schoulberg to pop out to nail down the last out in a 4-2, comeback victory, one that featured a two-run homer by catcher Alyssa Herion and a clutch double by little-used Allie Volko that scored the winning run. 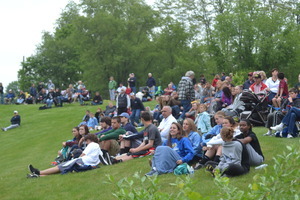 Along with these memories, they will also recall that after the top of the first inning, they were down by two runs. against Central Bucks South and Neshaminy, and a 3-1 victory over Souderton two days before. Then they ran into No. 9-seeded North Penn and their star pitcher, Jackie Bilotti and the hot-hitting Maidens. North Penn put two quick runs on the board on the strength of two doubles by lead-off batter Erin Maher and Bilotti, who later came around the score on a sacrifice fly by Becky Christoffers. Bilotti began her pitching game with a masterful use of off-speed pitches, striking out both Logan Needham and Emilee Beck. Balint was then hit by a pitch, and came around to score on Herion’s two-out, two-run home run that cleared the 196-foot sign in left center. Although no one could have possibly known it at the time, the only remaining scare the Red Devils would have on the day would never appear on the scoreboard. With two outs in the top of the second, Balint fielded a come-backer to the mound hit by North Penn’s Vicky Tumasz. The ball ricocheted off Balint’s glove, and in her attempt to retrieve it, she stumbled to the ground while making the toss to first for the out. Limping slightly on her way back to the dugout, Balint spent the next half inning stretching out what appeared to be a bruise to her right leg, but returned to the mound in the third. Throughout the course of what is now a 19-4 campaign, first-year coach Julie Hatfield has repeatedly complimented her team not only for their tenacity, but for the shared distribution of credit for victory. Last Thursday, it was ninth-place hitter Allie Volko’s turn. Emma Daly reached on an error to begin Avon Grove’s half of the fifth inning, and went to second on a sacrifice bunt by Volko’s sister Taylor. 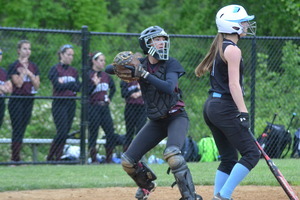 With one down, Allie clubbed a double over the head of North Penn left fielder Celeste Rosato that scored Daly. Needham then reached on a second misplay by Rosato, advanced to second on a passed ball, and came around to score the red Devils’ final run on a bloop single to right by Emilee Beck. North Penn could do no more in the sixth and seventh against Balint who, despite being hit by three pitches in the playoffs and getting bruised in the top of the second, surrendered only four hits on the day while striking out seven.